Video clip synopsis – Construction of the Sydney Harbour Bridge commenced in 1925, after more than 100 years of contending ideas about ways to cross the harbour. This animation is about the earlier designs for a bridge to span the harbour. Broadband MP4 spanning_bb.mp4 (8.8MB), suitable for iPods and computer downloads. Spanning the Harbour is an animation commissioned for the website Constructing Australia, created as a companion to the three-part series entitled Constructing Australia, produced in 2007. A Film Australia Making History production. The animation Spanning the Harbour was produced by Roar Film. 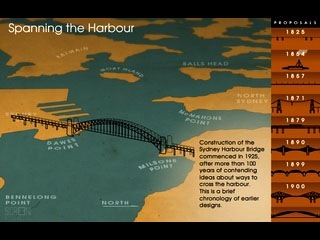 SPANNING THE HARBOUR ANIMATION NARRATIVE – A concise history of the contending ideas about ways to cross the harbour. List the aspects of the bridge that you would like to see covered — for example why it was built, how long it took to finally decide on the best way to span the harbour, who built it and how, what it felt like when it was built, etc.